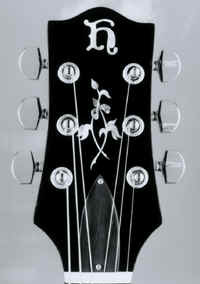 Hand made guitars - hand built guitars- handcrafted guitars - luthier - all different descriptions of what I do. When I first started making guitars I was often asked why I built instruments in the old fashioned way--each guitar built by one craftsman. These days when we are in the middle of a renaissance in handcrafted guitar making, that question is not asked so often. The answer to the question then, as now, is actually quite simple-- I love to work with wood and tools. I also love guitars and guitar music. There is also a more complete, and more complex, answer to the question. The initial impulse to build my guitars grew out of a dissatisfaction with the quality and feeling of assembly line instruments. I believe that the essential element missing is the intimate interaction of a single craftsman with both the customer and the materials throughout the entire process of creating a fine acoustic instrument. This does not mean that I think "factory" instruments (whether from large or small factories) are inferior. Rather, instruments made by a single craftsperson are unique, and that uniqueness is valuable to many guitar players and is a choice which should be available to anyone looking for a fine instrument. Another essential feature of the handcrafted instrument is that it can be carefully tailored to the individual buyer -- customized, if you will. I make only one quality of guitar -- the best that I can. I use only the finest solid woods available and painstakingly assemble them into fine guitars. In this web site you will see a variety of models and decorative options, some of them very expensive. These elements do not increase or decrease the care and craftsmanship that goes into each of my instruments. If you are interested in my guitars, I encourage you to call my shop to talk about any questions you have. I love to talk to my customers about guitars, and there is no way that I can fully describe them in print, much less anticipate the questions you may have. I am willing to consider almost any option or variation you might want -- many of them are listed in the following pages. Others, such as custom shapes, different scale lengths, custom neck size and contour, and a wide variety of wood choices, are purely at the whim of the buyer (and, let's be honest, your willingness to pay). I make eight basic models or shapes. Links to the pages describing them are below. One final word -- WARRANTY -- My guitars carry a limited lifetime warranty -- to the original owner -- which covers any defects in materials and workmanship. This does not cover normal wear and tear such as fret wear, nor does it cover abuse. The full written warranty is set out HERE. However, be warned: it was written by a lawyer, and you may find it a bit dry. Our address, phone number and e-mail address are listed in the home page of this site. We hope to hear from you.